"Ethiopia: From Where to Whereto"
Ethiopia’s history reads like a fairytale book (which it is not). Ethiopia is the Cradle of Civilization. I have one word to sum it up: Lucy (????? ), the Mother of the human race. Is she beautiful or what! That aside, Ethiopia’s history and its contribution to civilization is a documented matter of record for everyone to read and see. The late Emperor was the father of modern day Ethiopia in the 20th Century. He introduced modern education, and attempted in all earnest, to eradicate ignorance and poverty. However, he fell short mainly because he could not and would not balance the needs of the Ethiopian people with his desire to remain an absolute Monarch. On top of that, his failure to recognize the need for land reform; and ignoring to curb the rampant corruption of his government, lead to his eventual downfall. The 1973-1974 famine was just the last straw that broke the camel’s back. And then, there comes a bum named Mengistu and his red terror. I remember people privately calling for forgiveness (???? ????) from the murdered Emperor; for prematurely celebrating his ouster by the DERG. Little did people suspect that DERG would go on to become the most ruthless regime the world had ever seen. Mengistu and his followers murdered hundreds of thousands of innocent civilians. Young people were butchered and dumped at the door steps of their parents’ homes. Other corpses were collected and stored at Menelik Hospital for identification by the parents. The bodies were released after collecting the cost of the bullets that were used in their murder. DERG cadres murdered indiscriminately, innocent civilians in every city in Ethiopia. Air raids were conducted on civilian populations in Tigray and Eritrea, for the sole purpose of intimidation, demoralization, and sheer show of fire-power. Would anyone believe that Mengistu still has supporters in the Diaspora? Actually some of Mengistu’s DERG government appointees, including an ex-Agriculture Minister named Eng. Hailu Shawel, ran as political leaders in the Ethiopian elections of 2005. It is mind boggling! Remnants of DERG are still roaming American and European streets, and plotting to reverse their defeat. I seriously doubt that they will ever succeed! However, the whole idea is nauseating. I believe the time is now, for Ethiopia to become whole again. Ethiopian Nations and Nationalities have been empowered after the ratification of the Constitution, which granted them equal rights; and to decide on their own fate, up to cessation. However, the break-up of Ethiopia is not in the people’s mind right now. Prosperity through development; the fight against disease; and the alleviation of ignorance through quality education have become their priorities. The EPRDF leadership, from all indications, is in sync with those of the Ethiopian people at large; which is a real blessing to say the least. With Ethiopia being endowed with abundant natural resources, including rivers and lakes; fertile land, and generally favorable climate; the potential for the country to become the breadbasket of Africa and beyond, is a foregone conclusion. However, my primary fascination is with what Ethiopian Tourism Industry would become. Arguably one of the most stunningly beautiful countries in the world; add to that the historical land marks and its rich wildlife; Ethiopia would become among the premier destinations in the world for tourists. The EPRDF government recognizes the great potential that tourism has to offer; and they are expressing through the media that they intend to aggressively pursue this venture not only for its obvious economic outcome, but also for the rare opportunity to show the world the real Ethiopia. 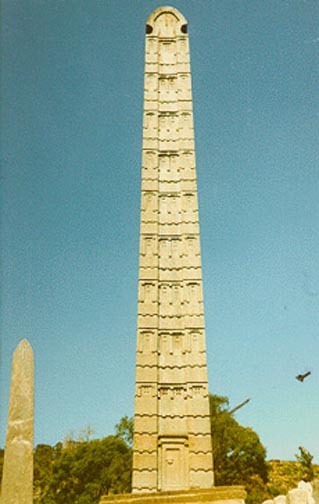 I am proud of where Ethiopia has been throughout ancient history. Ethiopia has gone through many trials and tribulations under various monarchies; and has experienced fascism under Mengistu and his vicious military junta. In my opinion, Ethiopia is now headed in the right direction. We must all remain vigilant to avoid the traps that are being set by our internal and external enemies. God forgive us all if we fail to protect the political and economic gains which have been achieved by the Ethiopian people; after enduring untold suffering for so long.